Now, I have an image and want to assign parts of it to several triangles like in the center image above, such that it is continuous but distorted according to the triangles. I would prefer a solution where i can assign arbitrary [0,1]² coordinates of the image to a tikz path (triangle) so that the image gets interpolated and stretched according to this coordinates. However, bringing both together makes a very hard time of getting the correct stretch factors and getting continuity. Note, that I want to have the effect from the 'Affine' image for multiple triangles. Inspired by the linked answer to "Draw Text in different shapes" I found a solution. 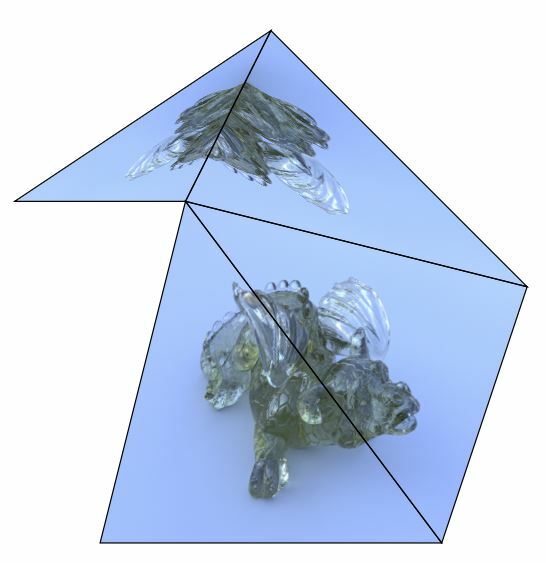 It computes the affine mapping for a texture to a single triangle and does clipping and drawing in the unit texture space. Unfortunately, the solution is not robust due to limited computation precision and range. Depending on the triangles one gets errors or just vanishing triangles. % Get X and Y of a coordinate as separated variables. TikZ: Node at same x-coordinate as another node, but specified y-coordinate?